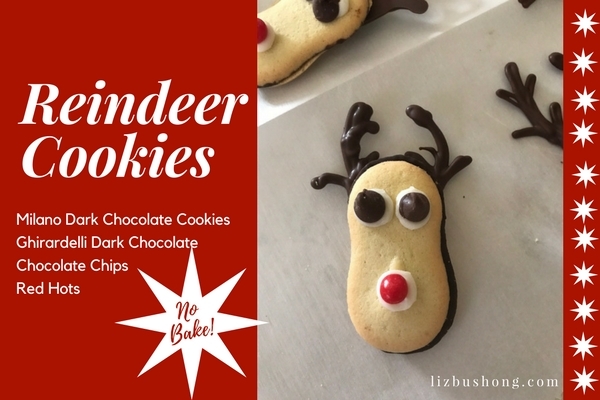 Cute reindeer faces are created using Pepperidge Farm Milano Dark Chocolate Cookies and Ghirardelli Dark Chocolate Melting Wafers are piped to create the antlers. Frosting dots with chocolate chips and cinnamon red hot are piped for eyes and nose. So cute and so much fun to make. 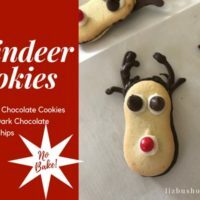 Create Christmas fun with Reindeer cookies made from Milano Dark Chocolate cookies. In small saucepan boil 1/2 cup water. Remove from heat. In dry glass measuring cup add melting wafers. Place this cup in saucepan with hot water. Be sure not to get any water or steam on the chocolate. Stir to melt. Using a disposable piping bag with no tip, add melted chocolate. Clip small opening of filled piping bag and pipe antlers onto parchment paper. Allow to sit until solid and able to pick up. To help reinforce the antlers, connect the chocolate dots with melted chocolate. While chocolate is wet, gently press one end of cookie to the melted chocolate. Allow chocolate to harden before moving cookie. Fill second piping bag with frosting, make dots for eyes and nose, then add chips and red candy. Allow to harden before storing in covered container.